The final attraction that we visited on our holiday in Snowdonia was the Llechwedd Slate Caverns in the heart of Snowdonia. We were lucky because we only had to wait for a few minutes at the ticket desk and then managed to get straight onto the next tour. The tours run every 15 minutes, but you might need to wait for the next tour with spaces. Although you can book tickets online in advance to save waiting at the ticket desk, you can't choose a specific tour. So if you are visiting when it's likely to be busy (for example in the school holidays on a rainy day!) then it's worth arriving early as I can see that you might end up with a wait! 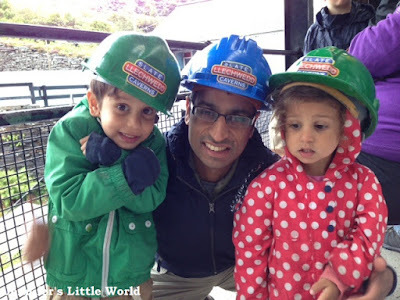 We donned the obligatory hard hats and boarded the train down into the mine for the Victorian Mine Tour. The train into the mine is the steepest cable railway in Britain. Harry was a bit apprehensive as it's quite a small train and as you go down the lighting is quite dim, but it's not a long journey and he was fine. 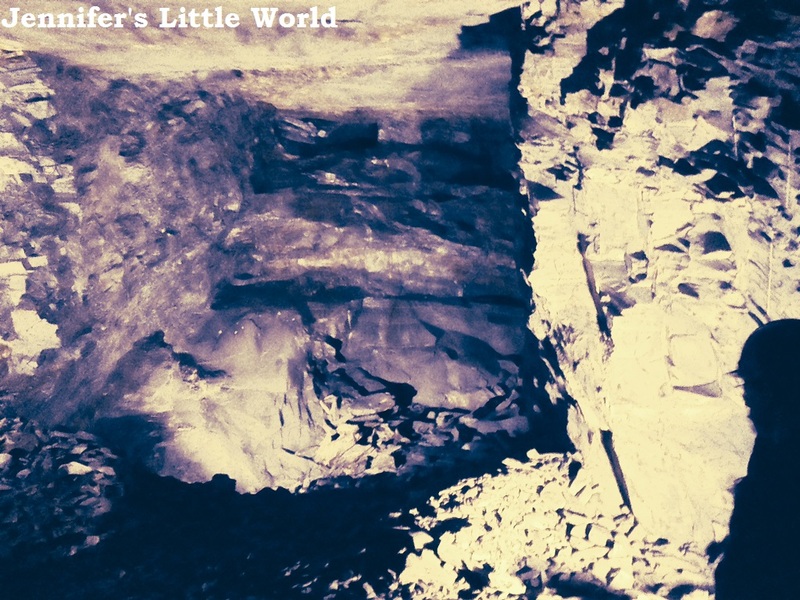 At the bottom, the guide gives you a brief introduction to the mine, and then you move through a series of caverns with a short stop at each for an audio and visual presentation that focuses on the mine as it was worked in Victorian times. 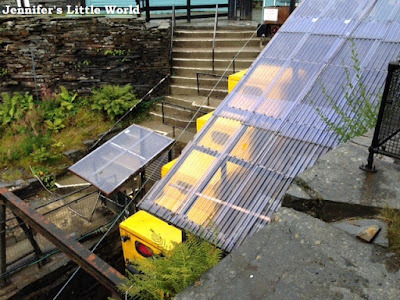 This part of the tour tells the story of Sion Dolgarregddu, a twelve year old boy who has just begun working in the mine digging slate with his father. 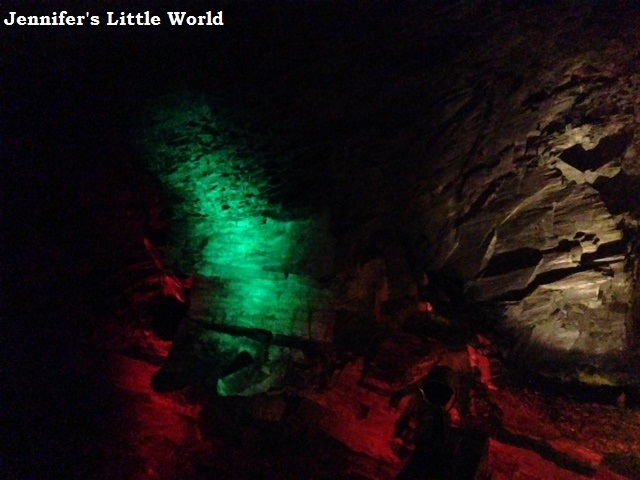 Although a focus of the tour is the hardships faced by the miners, some of the caverns are breathtakingly beautiful. There is a lovely walk alongside an underground lake which was like something from a fairytale, and at many stops lights and music are used to highlight the impressive caverns cut from the rocks. I tried to take some photographs but I'm afraid they don't really show off how lovely the caverns looked. The tour guide also demonstrated to us the tools that the Victorian miners used. It really was shockingly difficult, slow and dangerous work, and for minimal pay. The temperature in the mine remains constant throughout the year, and I was interested to see some racks which are used for storing cheddar cheese underground to mature for three months. The cheese is on sale in Sainsbury's, so I'll be looking out for it now! The tour lasted about an hour, and after the tour we were treated to a slate splitting demonstration above ground in the workshop. Harry was very lucky, and was chosen to help the demonstrator. 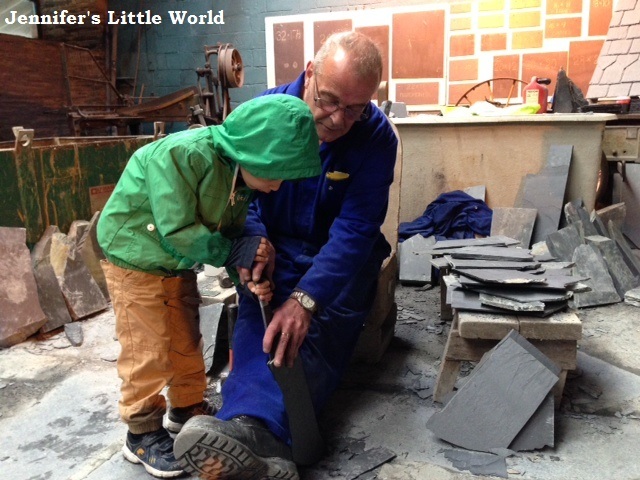 He was so interested, and absolutely thrilled to be able to take home the piece of slate that he had helped to split! 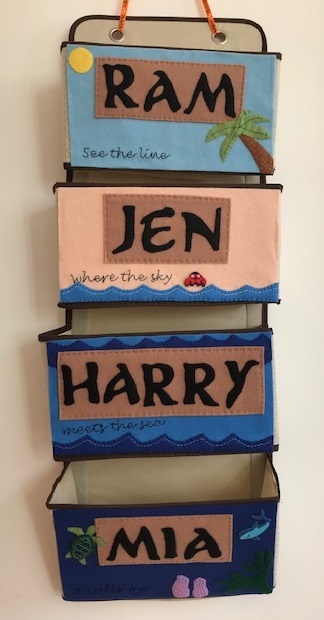 You can buy a piece of slate from the mine to take home for £1, as well as all sorts of slate souvenirs like coasters, wine racks, or personalised nameplates for your home. There are 61 steps to descend on the tour and 70 steps to ascend. They are well lit and wide, and we didn't have any problems. Inside the mine it is quite cold and damp, so make sure to dress warmly. There are points on the tour where the lights are dimmed and very briefly turned out, and a few narrow tunnels to walk through, but the caverns underground are fairly spacious. 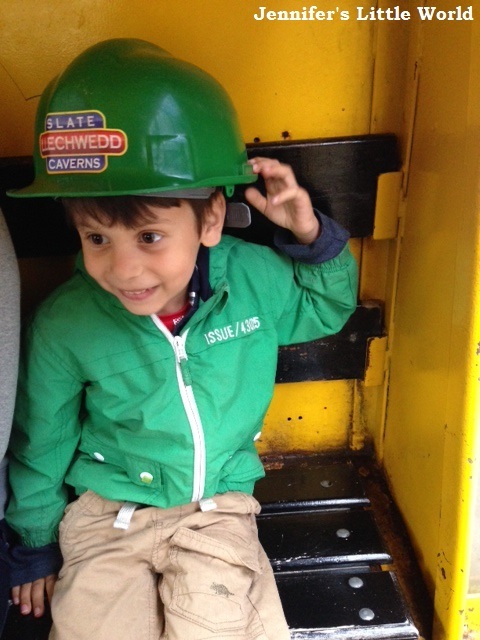 We were provided with complimentary tickets to the Llechwedd Slate Caverns in exchange for this review. An adult ticket to the Victorian Mine Tour is currently £14.95, and a child ticket is £9.95. Children under 3 are free and there is a 10% discount if you book four or more tickets including at least one adult ticket.